Yep, now we do have twin oil coolers like the US Models which should include the Auto's I am sure. Check the upper right picture in your attachment in Post #82 above. Seems the Autos still only have one oil cooler. First, this manual I have shown here is the LHD US/Canadian Version. SO Just to confirm this..
Series I in the US 6SP Manual Had 2 oil coolers, your Auto's only had one as did the Australian Manual and Auto versions only having the one. Series II, The Australian Manual (mine) and US have 2 oil coolers, and it appears the Auto's still have only one? in both countries?.. WHY?, Why would Mazda penny pinch on such a critical Item when the largest percentage of US engine failures were the Auto's AFAIK. Have I got that correct Rob?, Great find mate. I really thought both Auto and Manual (Series II) would of had 2 oil coolers, I must check out an Auto when at the dealer this coming week. Having said that we know the Auto does not Rev as high, but it is still a 6 port motor? Last edited by ASH8; 01-04-2009 at 02:36 AM. Can I suggest summarising each finding in post #1. The opening for the oil coolers on the front is larger, but is the opening on the back the same? This is critical as I always thought the front opening was large enough, but the small slits in the back were probably choking the flow a bit. As it is, even the Series 1 oil cooler intakes had plenty more open area than either than cooler itself or the exhaust. 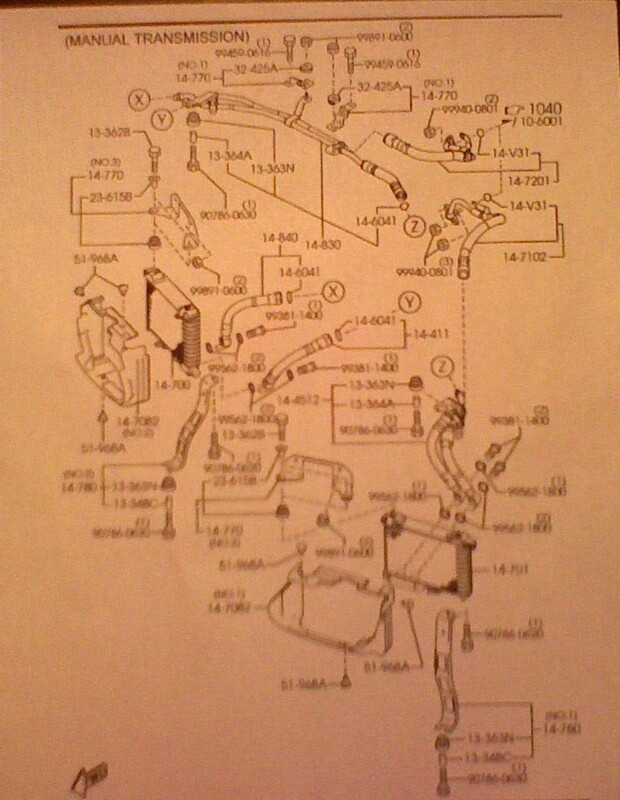 Here is the US AT and Manual oil cooler parts breakdowns for the 2009 models. The 19's are lighter than the 18's? Interesting. why did they change the baffling in the sump? Was there some kind of problem identified? so they've decided that with the new oiling they dont need that cooler in the autos. Did any autos ever have 2 coolers??? Ok--has anyone grafted a 2nd gen oil pan on to our car? Aviation guys have done this? It may be possible that one EMOP does the existing two outer oil injectors and the other EMOP does the "Trailing" centre oil injector? Yes. One of the EMOPs are for the two center oil nozzles (1/rotor), and the other for the 4 (2 per rotor) side nozzles. Why Mazda increase the oil pressure so much? Because of the better cooling (higher oil flow), or to avoid the part's surface contact? As I remember ( now I don't have time to check the correct data) the pessure is almost 2 Bar higher in the series II. ( xxw-30, 100C, 3000 rpm). A WS manual does not tell you what has changed. 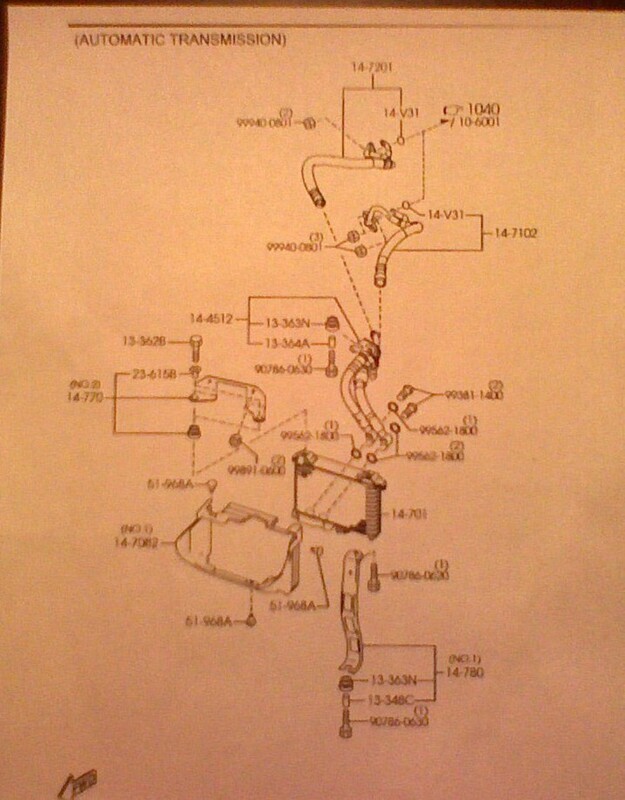 Mazda Parts will tell you if the number has changed, which it has. I can confirm the Fuel tank is 5 litres (about a gallon) larger. From the WS manual all other parts and locations appears the same. The tanks is located in the same position. I would still use pre-mix no matter what combination of oil nozzles they put in there. More importantly, the oil distribution is going to be more uniform coming from the fuel source rather than the MOP nozzles. I'd still mix 400:1 or so in the tank and turn up the MOP 5% or so with a reflash. Anecdotal evidence from some owners (a guy on this forum from Omaha or Oklahoma, can't remember), who have owned both "versions", suggest that the '09+ is using more oil than their previous RX-8. i would like to see more comments about this. i asked that question and got a no in another threat. i have a lot of respect for MazdaManiac but would still like a little bit more response. I got my 09 so i wouldnt have to pre mix but will if it needs it. I think you're the guy I was referring to in my post above. Can you comment on oil consumption in your '09 versus your previous 8? i was using 5oz per tank in my 05 with no oil use between changes, every 3000miles. my 09 uses about half a quart every week. i average 450 to 500 miles a week, which is about 75% interstate. That is quite a lot of oil. Maybe the centers are injecting quite a bit more than we suspect since there's no center port and so the center injected oil is less likely to escape and damage the cat and this also means it's less of an emissions concern? Either way, unless evidence proves otherwise, I'd still probably assume that Mazda is injecting less oil than optimal for emissions reasons. It's better to be on the safe side; a cat costs a lot less than a new engine.